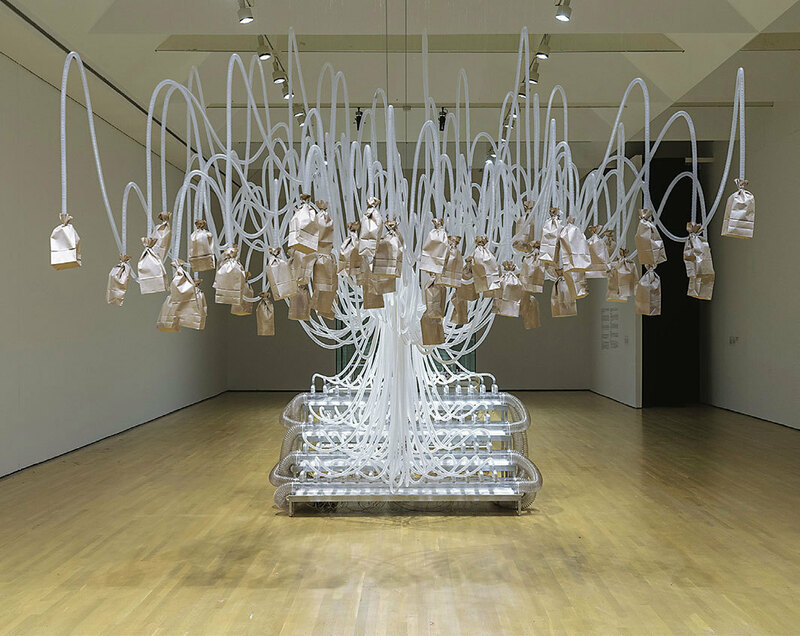 Rafael Lozano-Hemmer, Vicious Circular Breathing, 2013, sealed glass prism with automated sliding-door system, motorized bellows, electromagnetic valve, sixty-one brown paper bags, custom circuitry, respiration tubing, sensors, computer. Installation view. Photo: Guy L’Heureux. In 2007, Rafael Lozano-Hemmer became the first artist to represent Mexico at the Venice Biennale. Having won numerous awards and accolades from organizations such as Ars Electronica, the British Academy of Film and Television Arts, and the Zentrum für Kunst und Medientechnologie in the 1990s and early 2000s, he has since become one of the leading “new-media artists,” with works in the collections of the Museum of Modern Art in New York and the San Francisco Museum of Modern Art. This year alone, he will have five solo exhibitions and projects across three continents, the most important of which is this overdue selective survey in his adopted hometown of Montreal, cocurated by the Musée d’art Contemporain de Montréal and SFMOMA.